Asterix & Friends is a colorful, comical and entertaining free to play browser-based strategy MMO where you take on the role of an indomitable Gaul warrior, responsible for rebuilding one of the villages sacked by the invading Roman army under the command of Caesar himself. Players have to manage all aspects of their city/village like build buildings, collect resources, raise a resistance and go head-to-head against the Roman legionnaires that threaten your lands. The game is true to the Asterix & Obelix franchise in both style and graphics and throughout your journey you will meet a number of famous faces from the cartoons and comics that will both help and hinder you in your journey. It is the 50 BC and the Roman Legion has occupied Gaul, controlling all the territory, less a small group of villages which stand defiant against the Roman occupation, being a constant nuisance for his denial to be conquered. At the command of Emperor Caesar the Roman army has devastated nearby villages which have refused to pay taxes to their Roman “rulers”. These homeless refugees have asked for help to the most fearsome Gauls to ever stand up against the Roman might, two legendary warriors who stand impassively before the power of Rome: Asterix and Obelix. We will start rebuilding our pillaged village, first having to clean all the debris from the recent attack, build all the buildings necessary to improve the village and protect the village with a palisade defence. 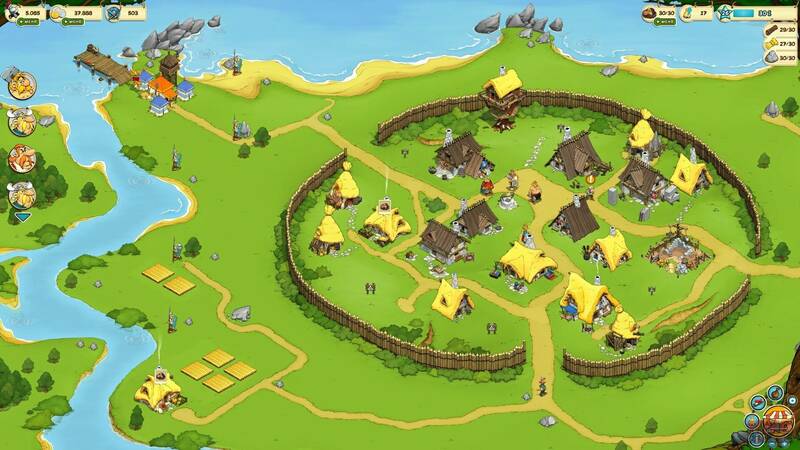 Players can choose from dozens of different building types, which will give you quests or produce the resources needed to feed the villagers. You can also build commercial buildings such as Carpenter, Stonemason or Blacksmith which are used to create a number of additional resources and products such as weapons to be used in the village. Each building costs time and money to build and as players level up they will be able to build more and more types of buildings that will help them in their fight against the Romans. As well as this buildings can be upgraded and improved, each building having its own level, which will yield better benefits and boosts to the village. Once you have armed your warriors with weapons created by your various production buildings you can send them to fight against the Romans. Selecting an enemy unit on the map the player is able to see the strengths of the Roman forces, once engaged they are able to select their available villagers that they wish to use in the attack. Each villager has their own strength value, as does each Roman, saw the larger the Roman force the more villagers (or at least better equipped villagers) you will need for the attack. The game will show you your chances of success before you start every battle, after which cute animation of the fight is shown using a comic style cloud with stars, fists and equipment bursting out of it as the two parties fight. Sometimes players are able to use Asterix and Obelix in their fights, both characters are highlighted as being undefeatable and will always defeat any forces that they go up against providing one of them is available to fight. Occasionally players will receive alerts that a Roman legion is approaching the village intending to attack it, by switching to the area map mode players are able to try and intercepts the Legion before it reaches the village. As you're playing, you'll receive missions and tasks from various NPC’s, including Asterix and Obelix themselves, with which you will have to help the Gallic resistance. These quests consist of various activities ranging from constructing specific buildings, get certain resources, or train certain troops, and in doing so players will earn XP to level themselves up and unlock new abilities and features as well as Sesterce, the in game currency used to purchase various items and buildings. With an easy point-and-click system your warrior character will run around the village performing his tasks, but he is not confined to the palisade walls, he will be sent outside to find animal tracks to hunt down boards for their meat and hides or out to the rivers and sea to fish. In Asterix & Friends, players can use Roman Helmets as the Premium currency, which can be used to speed up the construction time of various buildings or item crafting, or to purchase special items and buildings from the shop. This currency can be purchased with real money, and can also be earned everytime you level up.